The Spark-102 is low cost, ready to use industrial embedded System-On-Module (SoM) based on Altera Cyclone® V SOC. 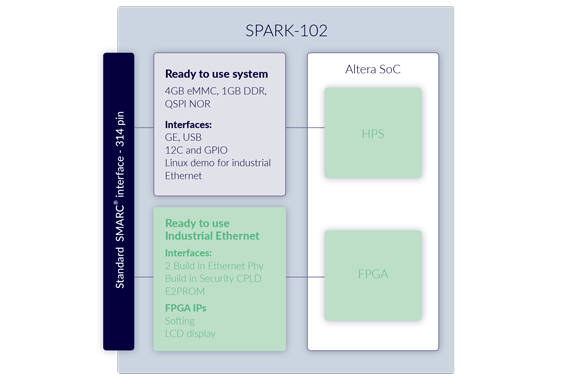 The Spark-102 combines a high performance ARM using one or two Cortex-A9 cores and a configurable FPGA. 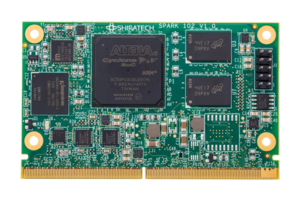 One Gigabit Ethernet and another optional two Fast Ethernet on board Phys enable fast bring up of networking applications. The Spark-102 uses a standard SMARC® interface, which is supported by key industry vendors, and ensures adherence to strict technical specifications as well as compatibility with other vendor’s platforms. Low cost beats the make option!